657816 Sergeant (Observer) Frank Charles Bunclark of the RAF Volunteer Reserve, 61 Squadron. Son of William John and Alice Ellen Bunclark of Lustleigh; husband of Born in Lustleigh in the December Quarter of 1915. Died 11 November 1942 aged 27.Buried in the Church Cemetery of St. John's, Lustleigh. Awarded the DFM. This was an unusual award in that the whole crew was judged to have been extremely brave and it was felt that each man should have a medal. The award is listed in theLondon Gazette 20.10.1942, 968521 Sergeant Stanley James Thompson, No. 61 Squadron, listed jointly with Sergeant S.T. Gunnell, 2nd Pilot; Sergeant F.C. Bunclark, Air Bomber; Flight Sergeant P. Campbell, Pilot; Sergeant C.H. Coakley, Wireless Operator; Sergeant E.H. Corbett, Navigator; Sergeant S. Smith, Mid-Upper Gunner. Tragically not all of this valiant crew were to receive their much deserved awards. 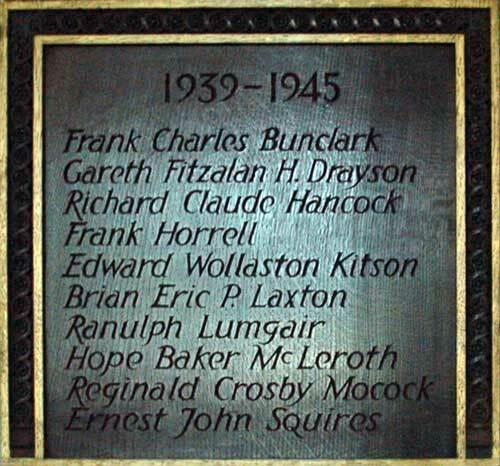 The entire crew were to be presented with their D.F.M.s by the King, on 24.11.1942, however five days before the ceremony Flight Sergeant Campbell, Sergeants Bunclark, Coakley and Corbett were all killed attempting a crash landing in Devon whilst returning from a mine-laying operation in the Bay of Biscay. 181248 Captain Gareth Fitzalan Howard Drayson of the Royal Army Medical Corps attached to the 10th Battalion, the Parachute regiment, Son of Rear Admiral Edwin Howard Drayson CBE (Rtd) and his wife Hilda Jeannie Drayson (née Harding) of Lustleigh. Born in London in the December Quarter of 1916. Died 19 September 1944 aged 28. Qualified as a Bachelor of Medicine at Edinburgh. 24070 Wing Commander Richard Claude Hancock of the RAF. Son of Claude Hancock DSO and his wife Henrietta Maria of Bovey Tracy. Born in Colverhill, Warks, in the December Quarter of 1901. Died 10 June 1941 aged 39. Buried in the Church Cemetery of St. John's, Lustleigh. 2358564 Signalman Frank Horrell of 21 Light Ack Ack Regiment, Royal Arillery Signal Section, the Royal Corps of Signals. Son of John and Margaret Eliza Horrell of Lustleigh. Born in Lustleigh in the March Quarter of 1920. Died 30 March 1945 aged 25. Captain Edward Wollaston Kitson of the Royal Navy, HMS Caernarvon Castle. Son of Major Edward Kitson and his wife Henrietta Aletha Kitson of Highweek; husband of Marjorie Kitson of Lustleigh. Born in Newton Abbot in the March Quarter of 1888. Died 18 February 1944 aged 55. Buried in the churchyard of All Saints, Highweek. D/SSX 22040 Able seaman Brian Eric Prentice Laxton of the Royal Navy, HMS Jaguar. Son of William and Harriet Emily Prentice. Born in Hereford in the December Quarter of 1919. Died 30 May 1940 aged 20. Buried in the Church Cemetery of St. John's, Lustleigh. 126490 Captain Ranulph Lumgair of the Seaforth Highlanders, attached to the 8th Battalion, the Argyll and Sutherland Highlanders. Son of David and Jessica Yates Lumgair; husband of Nancy Lumgair of Edinburgh, Born in Birkenhead in the December Quarter of 1910. Died 3 March 1943 aged 32. P/JX 161132 Leading Seaman Hope Baker McLeroth of the Royal Navy, HMS Glasgow. Son of Thomas and Louisa McCleroth Baker of Cadmore End, Bucks. Born in Edmonton in the March Quarter of 1924. Died 23 January 1944 aged 20. Buried in the Weston Mill Cemetery, Plymouth. 1168876 Sergeant (Air Bomber) of the RAF VR, 75 Squadron. Son of Owen Francis and Winifred Mary Mocock of Headington, Oxford. Born in 1922. Died 17 December 1942 aged 20. D/JX 151245 Leading Seaman Ernest John Squires of the Royal Navy, HMS Stanley. 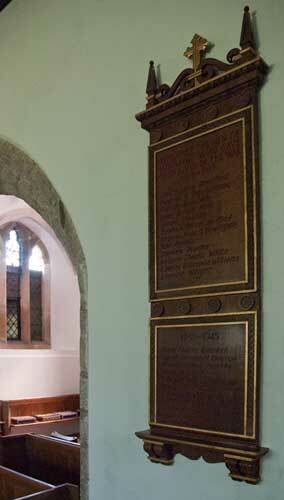 Son of Ernest and Jessie Squires of Lustleigh. Born in Lustleigh in the September Qaurter of 1920. Died 19 December 1941 aged 21 when his ship was lost.. Commemorated on the Naval memorial at Plymouth.